Walking down Boylston Street on Friday afternoon, Mom and I entered Shreve, Crump & Lowand didn’t leave for quite some time. We perused the cabinets full of gorgeous china, dishes, and gifts, and of course, beautiful, amazing jewelry. 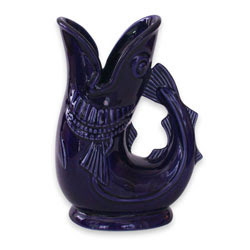 And while we were star-struck with the diamonds and pearls, I fell most in love with these unique vases…in the shape of fish! 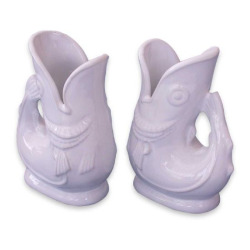 We joked about using them at a wedding, laughing at the absurdity…but then, at second glance, I pictured them at a seaside wedding reception, at every table. Miniature ones being used as favors. And now, I’m obsessed. I love them. They come in every color, and the white, blues and pinks are especially suited for a unique decor that I could envision for a wedding by the ocean.